Following the disappointing lack of success of "Freeways" album and growing musical differences, Randy Bachman left "Bachman Turner Overdrive" in the spring of 1977, and recorded the second solo album called "Survivor". He retreated to his west coast home to ponder his future, and while serving as producer for other acts including "Trooper", he began writing new material while searching out the supporting cast for his new group. 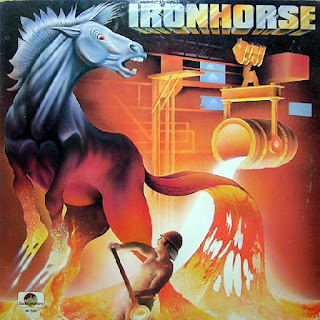 In 1979 Randy Bachman with Tom Sparks (vocalist/guitarist) formed a band called "Ironhorse".Drummer Mike Baird and John Pierce on bass were soon recruited to round out the group. At the same year (1979) the band released their debut album "Ironhorse". It was described as Bachman's outlet to let loose all his penned up musical frustrations, the album ran the gamut of rock's spectrum, from the gritty "Watch Me Fly" and "Old Fashioned" to the almost-eclectic "Stateline Blues". The first single "Sweet Lui-Luise" showed great promise, cracking the Top 100. By that summer their second single "He's A Joker" hit the airwaves and also gained moderate success. "She's Got It", penned by Sparks was quick to follow, while the band was on the road finishing up their first North American tour.